No matter how much power the federal government may have, when a jury refuses to side with it, the feds lose. 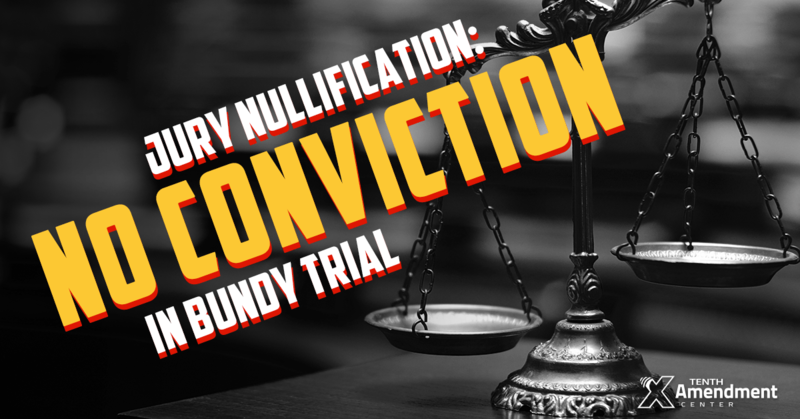 In what was effectively a case of jury nullification, jurors declined to return any guilty verdicts against four men involved in the 2014 Bundy Ranch standoff. The Arizona Republic called the verdict “a stinging defeat” for government prosecutors. After deliberating for four days, jurors did not return a single guilty verdict. It acquitted Richard Lovelien of Oklahoma and Steven Stewart of Idaho on all counts. The jury also returned “not guilty” verdicts on the most serious charges of conspiracy and extortion against Idahoans Eric Parker and O. Scott Drexler. The jury hung on weapons and assault charges against the two men. During the standoff, armed protesters faced down heavily armed federal agents, along with state and local police, as the Bureau of Land Management attempted to round up cattle belonging to rancher Cliven Bundy. The dispute dates back to the early 1990s when Bundy refused to renew his permit for grazing cattle on federally owned land near Bunkerville, Nevada. According to the BLM, Bundy continued to graze cattle on the “public” lands without a permit. On March 27, 2014, the feds shut down 145,604 acres for the “capture, impound, and removal of trespass cattle.” Agents began the roundup on April 5. Seven days later, protesters, some of them armed, advanced on what the BLM described as a “cattle gather.” After a tense standoff, and negotiations brokered by Sheriff Doug Gillespie, BLM director Neil Kornze agreed to release the cattle and de-escalate the situation. Federal prosecutors began charging people in connection with the standoff nearly two years later, after protesters took over the Oregon Malheur National Wildlife Refuge in January 2016. The Bundys argue, and rightfully so, that the federal government lacks the constitutional authority to own and manage large swaths of landw within the border of a state. U.S. District Court Judge Gloria Navarro wouldn’t allow defense attorneys to bring up the constitutional issues in the four men’s defense and rejected testimony from five defense witnesses. Ironically, she was trying to avoid “jury nullification,” according to the Arizona Republic report. Navarro’s rulings, aimed at trying to avoid jury nullification, severely limited defense arguments. Jury nullification occurs when a jury returns a verdict based on its shared belief rather than on the evidence in a case. Navarro barred defendants from discussing why they traveled thousands of miles to join protesters at the Bundy Ranch. She did not allow them to testify about perceived abuses by federal authorities during the cattle roundup that might have motivated them to participate. Navarro also restricted defendants from raising constitutional arguments, or mounting any defense based on their First Amendment rights to free speech and their Second Amendment rights to bear arms. In her rulings, Navarro said those were not applicable arguments in the case. The judge went as far as ordering Parker off the stand for bringing up forbidden topics as he tried to testify in his own defense. According to the Republic, Defense attorney Jess Marchese said the limitations placed on the defense had an impact on the jury. The judge apparently thought allowing the defense to raise the constitutional issues or to bring up the defendants’ belief that they were fighting federal tyranny could possibly lead the jury to reject the prosecutor’s case, even if the government could prove the protesters broke the letter of the law. Despite hearing those arguments, the jury effectively engaged in jury nullification. Jurors seem to have made their decision based on their impression that the prosecution was unjust, or at least unfairly carried out. Defense attorney Shawn Perez said jurors knew the government had tied the defense team’s hands. This verdict is reminiscent of many fugitive slave cases in the 1850s. Federal prosecutors found it very difficult to convict people under the Fugitive Slave Act. For instance, in Syracuse, N.Y., the federal government attempted to prosecute 26 people in connection with the rescue of a recaptured runaway slave known as Jerry. The feds only got one conviction. They simply couldn’t seat juries willing to convict. We don’t know what went through the minds of jurors in Bundy Ranch standoff case. It may not have been a conscious assertion of a jury’s right to nullify. But it was clearly jury nullification in effect. The jurors used their discretion. They smelled something fishy. They refused to convict. And it illustrates the tremendous power of the jury.